I can't imagine being more excited for spring! It's the perfect season to try something new and freshen up your resources! 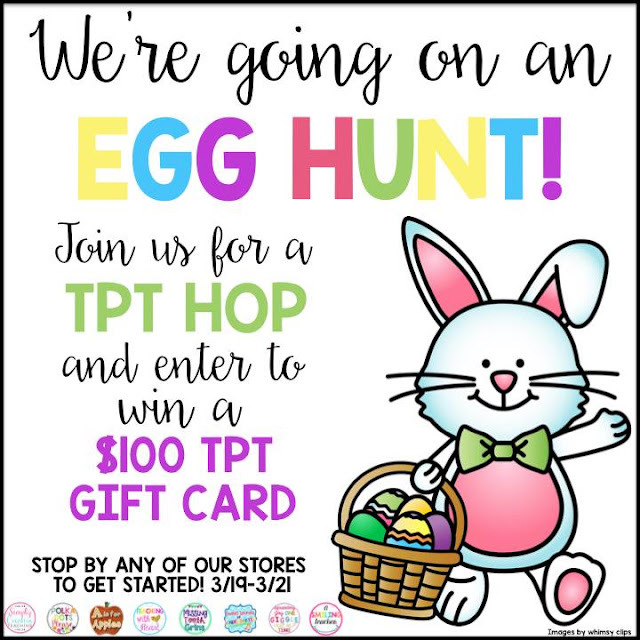 Some of my very talented teacher friends are getting together to bring you an EGG-cellent and EGG-citing GIVEAWAY to win a Teachers Pay Teachers $100 gift card! All you have to do is make like a bunny and HOP through our Egg Hunt! There are just 3 simple steps! Step 1: HOP on over to my store by clicking [HERE]. Follow my store and look for the letter in my banner! You can find it on the Easter Egg! Step 2: Click on my store banner. It will bring you right to the next stop on this little egg hunt. Follow the next store and collect that letter too. Hop around and collect 8 eggs! Step 3: After you have collected all 8 eggs, use them to figure out our secret message! Enter it into the rafflecopter for extra entry to win the $100 TpT Gift Card! You can start hopping at my store now! Good luck friends!